The Broadway shopping centre sits in the heart of Bradford City Centre. Anchored by M&S and Debenhams it has over 80 retailers, including a selection of coffee shops and restaurants. The leisure offer at the Centre has recently been expanded with the inclusion of a six screen Light Cinema. Gradus’ Esplanade 6000 primary barrier matting with Boulevard 6000 wipers in Nightfall was installed at five different entrances to the complex, providing an ideal matting solution for such a busy retail and leisure environment. Esplanade 6000 features 100% solution dyed nylon wipers providing excellent soil and moisture retention whilst the patterned design helps to disguise the effects of soiling. 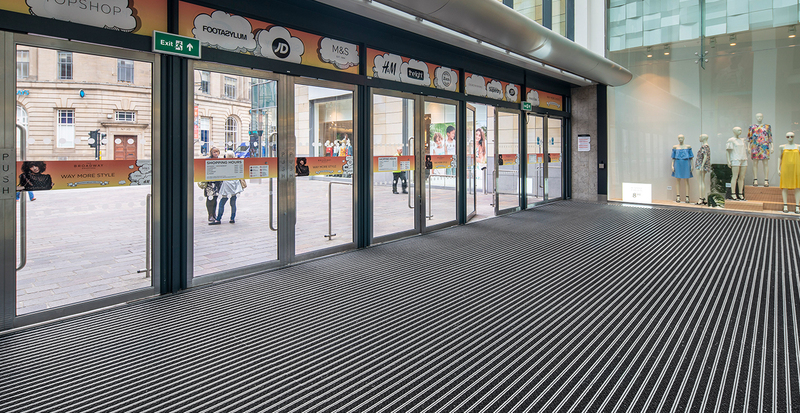 Karen Burman, Marketing Product Manager for Gradus, comments: “Barrier matting forms the start of the journey through a building. Our systems help to reduce the amount of tracked-in dirt and moisture, which reduces the risk of slips and trips caused by wet flooring.